Began the season on the injured list after suffering a knee injury near the end of training camp. Missed the first three regular-season games before returning to the lineup to start on July 7th in a home win over the B.C. Lions. Completed 64.8 per cent of his passes for 3,146 yards with 18 touchdowns and 13 interceptions, while rushing for 52 yards and another TD. His quarterback-efficiency rating was 91.0, fifth-best amongst CFL starters, while his QUAR rating was 72.0, also fifth amongst starters. Helped guide the Bombers to the postseason for a third consecutive season and the franchise’s first playoff win since 2011 with the victory in the West Semi-Final. His best statistical game of 2018 was his 358-yard, two-passing-TDs effort in a playoff-clinching win over Calgary on October 26th. Has led the Bombers in passing yardage in each of his four seasons with the club and since being named the unquestioned starter in late July of 2016 has guided the team to a 30-15 record. Currently sits in ninth place on the Bombers all-time passing yardage list with 10,041, with Jack Jacobs ranked eighth at 11,094 yards. 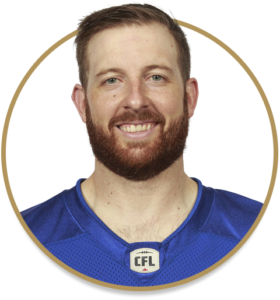 Backed up his 2016 season with an even better 2017, setting career-best marks for passing with 4,472 yards and 28 touchdowns against just eight interceptions in 17 games… His 103.8 quarterback-efficiency rating, 71.0 completion percentage and 3.5 touchdown-to-interception ratio all topped the CFL… Went 11-6 in his 17 regular-season starts, as a hand injury kept him out of the regular-season finale win in Calgary (started by Dan LeFevour)… Eclipsed the 300-yard passing mark in six games… Working with a broken ring finger on his throwing hand and a calf injury he completed 23 of 33 passes for 334 yards and three touchdowns and no interceptions in the West Semi-Final loss to Edmonton… Named the Bombers Most Outstanding Player for the second consecutive season. Played his first full season for the Bombers in 2016, passing for a career high 3,666 yards which ranked fifth overall in the CFL… Started the final 13 games after backing up Drew Willy to start the season and began with a 7-0 run to lead the club to the playoffs for the first time since 2011… One of only three CFL QBs to lead their club to 10-plus wins in 2016 as the Bombers went 10-3 in his starts… Passed for a playoff and overall career-high 390 yards in the 2016 West Semi-Final at B.C… Had a streak of 166 consecutive passes without an interception… Named the Bombers Most Outstanding Player… Signed to a contract extension on January 18, 2017. The Bombers acquired Nichols from the Eskimos on September 2, 2015 after injuries to both Drew Willy and Robert Marve for a conditional seventh-round draft choice in 2017 (later became a fifth-round selection after Nichols became the starting quarterback; Edmonton selected DL Kwaku Boateng)… Winnipeg went 2-5 in the seven games started by Nichols, dropping four of those games by a total of 13 points, as he threw for 1,757 yards with 10 TDs against seven interceptions… Re-signed on January 5, 2016. Signed with Edmonton on October 13, 2010 and spent the final three games on the practice roster… Dressed for all 18 games in 2012, backing up Kerry Joseph and Steven Jyles, completing 57.8 per cent of his passes for seven touchdowns, three interceptions and a 107.7 quarterback rating… Suffered a devastating broken leg in the 2012 playoffs… During the 2013 preseason Nichols was battling Mike Reilly for the Eskimos starting QB job when he suffered a year-ending knee injury… With Reilly then entrenched as the No. 1 QB, Nichols completed 62.3 per cent of his passes in relief in 2014, with four touchdowns and five interceptions… In 2015, Nichols made seven starts with Reilly injured and the Eskimos went 5-2 before he was traded to Winnipeg. Signed as an undrafted free agent with the Dallas Cowboys in 2010, appearing in two preseason games before his release. A four-year starter with the Eastern Washington Eagles, Nichols broke 14 school records and six Big Sky Conference marks… Was the Big Sky Conference Offensive Player of the Year in 2007 and 2009… His career passing yards (12,616) were the most in Big Sky Conference history.